Technology has changed our interaction with, and the way we experience the world. It has caused expectations for immediate response and gratification. However, with drawing and traditional printmaking, the results are not immediate, and are only attained after careful execution of a sequence of processes. Here, time is a non-digitized, non-replicated essence of the creation of each piece of art. I find that the time invested in drawing and the printmaking processes allows a self-awareness and a conscious enjoyment of the creative path in life. Each mark must be made by hand, each plate inked by hand, paper torn by hand and the print pulled by hand. When I create images on paper, plates and wood – the time it takes to render these processes is captured in the art. It is not an instantaneous event from our techno-present, but rather a creative act carried out over a precious segment of time . . . a commodity that is very rare and cannot be bought. In this segment of time, creating art captures my thoughts, feelings and memories, sort of an existential snapshot of moments. Jennifer L. Anderson is a book artist and printmaker working in many of the printmaking disciplines, primarily intaglio, relief printing, and stone lithography. She has exhibited throughout New England and Central California and her work is in private collections nationwide. In 2010, Anderson was awarded a residency at the KALA Art Institute in Berkeley, CA and was also selected as presenter at Printopolis, in Toronto, Canada. 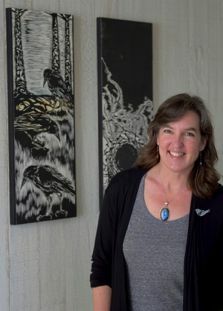 Anderson was an Artist Member of Two Rivers Printmaking Studio, White River Junction, VT, from 2001-2008 where she also taught book arts and printmaking and served on the Board of Directors. Anderson has been a resident artist at the Vermont Studio Center, a member of the California Society of Printmakers, and was most recently inducted into the Carmel Art Association and the Boston Printmakers as a new member. She currently works out of her home studio where she also tutors and teaches art to students of all ages and levels. Anderson is represented at Mission Gallery, San Juan Bautista, CA and The Carmel Art Association, Carmel, CA. Anderson has a BFA in Printmaking from the University of Connecticut and continued with graduate course work in printmaking and education from Central Connecticut State University and the University of Connecticut. She is currently studying to be a Great Books Scholar.